On Monday 4th March, Blackpool & Fleetwood ‘Box’ car 40 left Blackpool, just two days after operating its farewell tour of its home system. 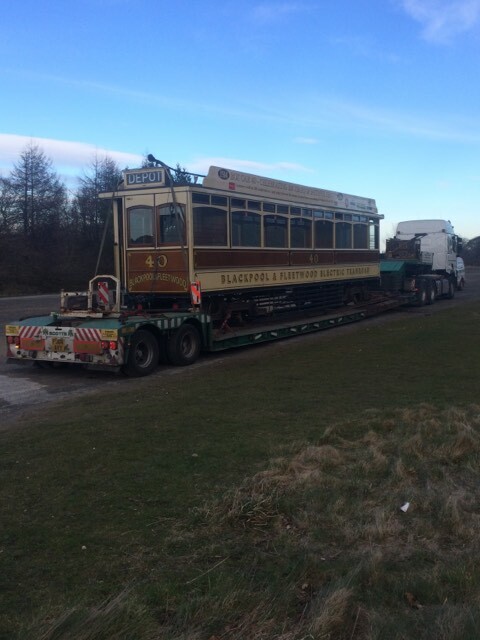 The tram was destined for Beamish Museum – arriving there later the same day – where it will run for a few months before heading back to its other home, Crich Tramway Village, later in the year. The morning saw the familiar sight of a low loader from Scotts Heavy Haulage parked on Blundell Street, ready to collect 40 for its road journey to the North East. Unusually, and thanks to its long trolley arm, 40 was able to be driven onto Blundell Street under its own power, its lifeguards having already been removed. Once its trolley was tied down, the car was loaded up with assistance from Crich workshop personnel, and set off shortly before midday, bringing its latest period of operation on the tramway for which it was built to an end. 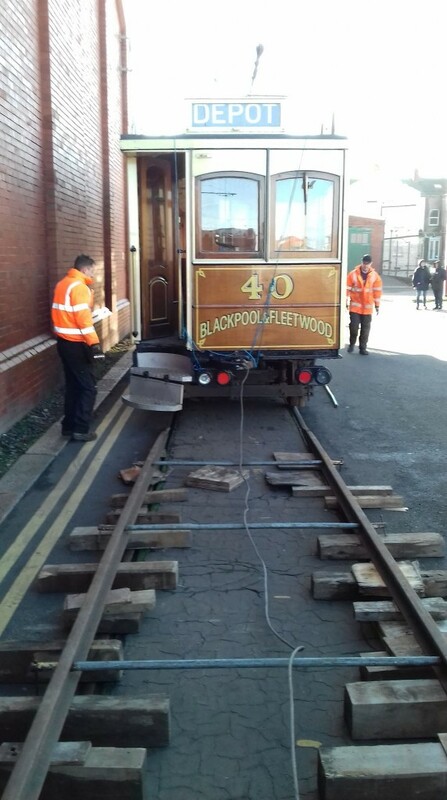 By the evening, Box 40 had safely arrived at Beamish and once unloaded, it was towed to the tram depot by fellow Blackpool tram, Marton 31. This pair were last acquainted in 2016-17 when 31 spent some time in Blackpool, but although the pair have been together in Blackpool a few times over the years, this is the first time that 40 has ever joined 31 at Beamish. Once commissioned 40 is expected to be released for service at its temporary new home and, although it is being promoted as one of the attractions at the Great North Steam Fair next month, it may well be used before that as Manchester 765 has already debuted in service due to a shortage of serviceable trams at the museum. Much has been said about 40‘s loan to Blackpool coming to an end, and this move has clearly upset many people. However, the tram is of course owned by the Tramway Museum Society, having been discarded by Blackpool back in 1963 when the inland routes and their associated depots were being closed en mass. Indeed, it is quite incredible that since then, 40 has spent vastly more time running in Blackpool than it has at Crich, having first returned for a visit between 1988 and 1991, and then returning for a longer stay in 1996. Apart from a brief visit to Crich in 2014, Box 40 had remained in Blackpool for nearly twenty-three years, and thanks must go to the TMS for allowing it to stay there for such a generous period of time. It is hoped that the car can enjoy a bright future wherever it is, and although a lot of dramatic comments referring to 40‘s ‘last ever’ runs in Blackpool, it has already left ‘for good’ twice before and embarked on many adventures over the years – so who knows what the future might bring!? This entry was posted in Beamish Tramway, Blackpool Tramway. Bookmark the permalink. Well said Andrew who knows indeed! Its very noticeable how easy and quick it is to move a single decker with its pole on the roof that can be tied down! I accept Crich intend to run 40 and just hope its entrance doesn’t prove to be too much of a problem on the short Museum line. I have visions of Walter Luff’s thoughts on Box cars being relevant again! I agree that many thanks are indeed due to the TMS for their generous loan of this car to Blackpool, but now that Blackpool Heritage Trams, together with Fylde Transport Trust, are introducing more ‘new’ heritage vehicles to their joint fleet (such as 143 and hopefully very soon 279), the time must have arrived for (in the words of Monty Python) something completely different. Of course, 40 has not gone in the absolute sense as it is only elsewhere and will soon offer the opportunity for a ride on the wonderful circular system at Beamish and is then only going on to Derbyshire rather than for example San Francisco, as with a previous visitor to Beamish! So it will only be a bus, train or car trip away for most rather than half a day’s flight. It’s worth remembering too, that 2023 will be the 125th Anniversary of the Blackpool and Fleetwood Tramroad and should it be decided that something more than a casual nod to the occasion is desirable, then we may indeed see a brief return of 40, possibly along with Rack 2 and 167. Of course nothing should be taken for granted as by then, a traditional-looking English Electric Railcoach would probably be available along with a couple of Coronations and hopefully OMO 8 in addition to cars such as 621 and 648, not forgetting Pantograph 174 albeit in the guise of illuminated Carriage 734. Therefore it might be considered more economical to stick to ‘in-house’ tramcars – we shall just have to hope and to wait and see, always remembering how fortunate we have been to have 40 for so long on its ‘home’ tram system.